This monster cannot be Special Summoned except from the Graveyard, and only if it was sent there from the field. When this card is Special Summoned, select 1 monster in your Graveyard. This card gains.. When this card is Special Summoned from the Graveyard, its ATK and DEF increase to become twice its original ATK and DEF. When this card destroys a monster by battle and sends it to the Graveyard, inf.. When this card is selected as an attack target by your your opponent's monster, select 1 Level 7 or higher Dragon-Type monster from your Graveyard, Special Summon it, and switch the attack to that mon..
During your Battle Phase, if your opponent controls a monster after this card's first attack, this card can attack once again. Negate the effect of any Trap Card that targets this card, and destroy th.. This card is unaffected by the effects of Spell Cards. During the End Phase of a turn that this card destroyed a monster by battle, you can send this card to the Graveyard to Special Summon 1 "Horus t..
You can Normal Summon this card with 1 Tribute. If you do, it is sent to the Graveyard during the End Phase. 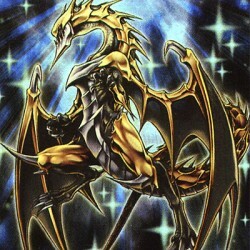 During battle between this attacking card and a Defense Position monster whose DEF is lower.. Select 1 monster from your Deck and send it to the Graveyard.. Select 1 monster your opponent controls. This turn, if you would Tribute a monster you control, Tribute the selected monster instead. You cannot conduct your Battle Phase during the turn that you acti..
Rhe equipped monster gains 400 ATK. During battle between this attacking card and a Defense Position monster whose DEF is lower than the ATK of this card, inflict the difference as Battle Damage. When..